Christmas time brings a lot of good out in people: joy, a spirit of giving, love. But it also brings out some of the worst in people, and by worst I mean Christmas outfits. 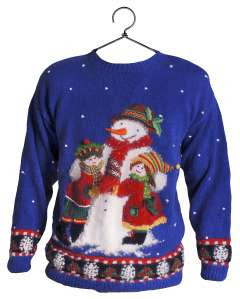 Well, for those of you that attend APC, tomorrow morning we are unofficially calling it “Crazy Christmas Sweater Day”. There is a group of us that hit the Thrift Stores today and picked up some ‘crazy sweaters’. I would invite anyone attending one of the services tomorrow morning to join in. It will be a fun way to celebrate all that is good and bad with Christmas!! 🙂 Hope to see you there in that sweater from 1980 with Rudolph and the blinking nose on the front! !